Although I grew up in the city, I come from farming people. I grew up with so many stories of the farm, the family, and the various chickens, goats, and cows, that I sometimes feel I lived alongside my ancestors. I’ve certainly romaticized their lives, although I know that it was a hard life; subsistence living is never easy. But I’ve heard their stories, told with a slight bitterness towards the privations, but mostly washed by a greater love of their lives. It makes me wonder if today, in our lives of relative ease, are we really happier? That little girl is all grown up now, and that chicken long emigrated to chicken heaven (grasshoppers and freshly sprouted gardens abound!). Some painters gripe about painters who paint from photos. “Why paint it if you can take a photo of it?” they ask. But without this dusty photo, I could not have made this sweet painting, and this little girl would have been lost. Are you a painter? What do you think about using photos? The model was clearly upset. She couldn’t sit still, let alone maintain a pose. It was wiggle, sift, sigh, and sink for the entire time. It wasn’t my place to ask her to leave, and besides, I think we were all trying to be kind—she seemed to be roosting in a nest of problems—so I had to just deal with it. It’s hard to keep my imagination down (I can imagine 20 ridiculous things before breakfast! ), so I ran with it, and pretended I was commissioned to draw a portrait of a rich, troubled, doomed girl (Paris Hilton came to mind). My imaginary patron was her doting Fortune 500 daddy. And I tried to find the things that a daddy would love in his wonky daughter, and express them in the portrait. By the end of the evening, I was ready to return the hypothetical advance to the hypothetical daddy, and my heart was aching for this poor, clueless model. James Gurney has a good post on activating your imagination while creating academic models. I loved his suggestion: add wings! 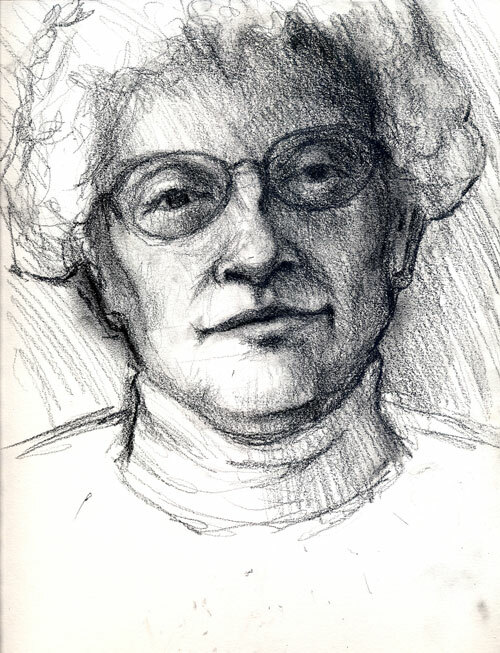 Graphite portrait of a good friend as she told me stories of her life on the farm. I love drawing and painting people. It’s a passion that runs contrary to my introverted character, but there you have it. Our brains don’t always behave in completely logical fashion. The thing I love most about portrait painting is that I get to touch a subject’s stories. I touch those their tales with my ears and with my paintbrush. Above all else, I love story. Last year was my Year of the Portrait, and I see no problem with 2011 being Year of the Portrait Part II. 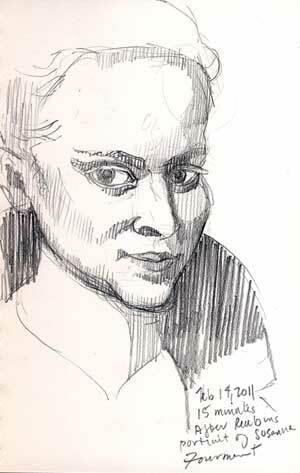 Wednesday I start a portrait drawing class with Felicia Forte, a teacher new to me. I am nervous, a bit (meeting new people is always out of my comfort zone), but looking forward to it. I recently bought a Niji waterbrush pen. It’s just a small synthetic brush attached to a tube that holds water. Squeeze it and water comes out. It is evidently a Japanese invention—you can read more about them at Russell Stutler’s sketchblog. He’s an American artist living in Japan, and his sketches of places in Japan are beautiful. The waterbrush pen has added a new dimension to sketching in the car. I can whip out a quick sketch with a cheap felt tip pen and then spend several more stoplights working out the details, adding form, value, and tone. One day last week while waiting at a particularly long light, I was pleased to look to my right and find a man wearing a fedora pulled up beside me. And he was smoking! How often do you see that in the Bay Area? The universe couldn’t have presented any better momentary travel companion. I dashed off the initial drawing with a plain old cheap felt tip pen during the 30-second red light, then I built up the drawing using the pen and waterbrush while I waited at subsequent stoplights. I finished the sketch in the parking lot and felt happy and satisfied as I started my day job. Some weeks are just harder to get through than others. This is one of them, with too much to do, and too much to look forward to. And I have to just get through it. I often lionize people who live outside the normal upper-middle-class life. 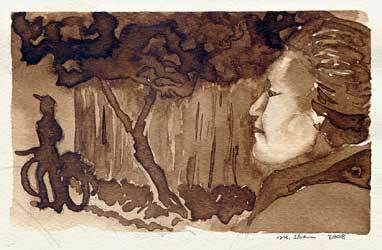 Those who travel the roads of their lives in amazing jalopies of color, sound, and action. Oh, and how I envy them! Yet I realize that these kinds of Odyssian life styles can’t be for everyone. There is honor in the person who daily just gets on with it. Who puts one foot in front of the other, even when that life path is boring, bothersome, tiresome, or even painful. They slog on even when disheartened—they’re not doing it for self-preservation or self-aggrandizement. The moms and dads, uncles and aunts, husbands and wives, partners and friends keep moving out of love and responsibility to those who depend on them. Here’s a shout-out to those day-to-day heroes. I met this lovely young woman at Friday Harbor Irish Music Camp. She had a boxwood flute that had bent as it aged, but it sounded lovely. One day while we were in class, the rain and snow stopped, the sky cleared, and the sun streamed through the windows. 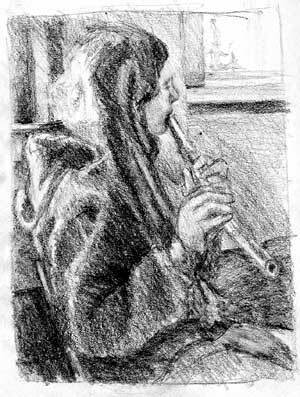 Sitting in a shaft of sunlight, the young woman glowed as she practiced her tune. I snapped a photo quickly. There was no time to fool around if I wanted to capture the naturalness in her posture. Youth is a time of great beauty, but also great self consciousness. 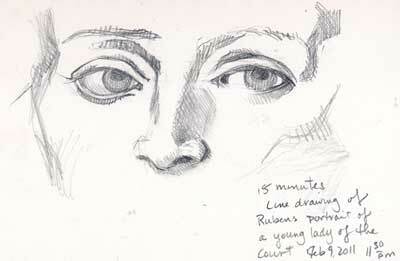 I’ve come to understand the importance of doing value studies before beginning a painting. Steve Curl, my watercolor teacher, told me that when I was designing the value study I shouldn’t focus on the details. Instead, he said, look for the large shapes of light and dark; I did, and it made all the difference. I’ve already practiced painting hands playing the flute, so I should be in good shape for her hands. The Palo Alto Baylands before dawn on the first day in May is a chilly place, quiet except for a few startled shorebirds and the shuffling of feet. People gather in the parking lot, talking quietly between yawns. Later there will be revelry, laughter, and silliness, but right now they wait. 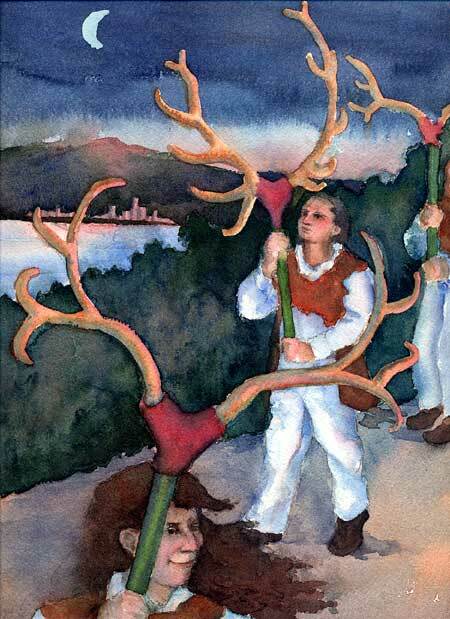 And just before the sun comes up, men carrying deer horns emerge from the darkness to dance to a haunting tune in a minor key. This is Morris Dancing, an English style of folk dance that is very old. No one is quite sure how old it is, but evidently records dating back to the 1600s mention it. It’s almost died out several times—Cromwell and his puritans put a temporary halt to it, then the industrial revolution bled people from their culture and nearly killed it—but was revived in the early part of the 20th century. How ironic that it’s had another revival in this age of technology killing culture. In fact, it may be that technology has helped it grow (although some predict a decline), and now Morris teams all over the world clash swords, shake bells, wave hankies, and dance to the music of accordions and fiddles. 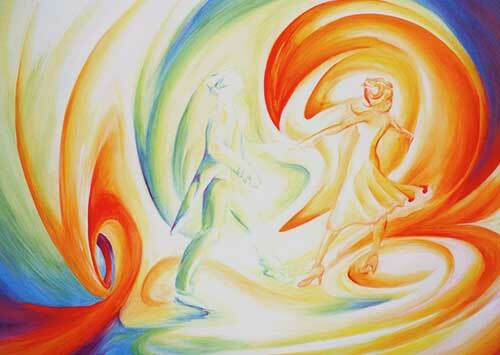 They dance to help the sun rise on May 1, a brilliant endeavor, and a happy one. Then, I believe, they go have some beer. The dance I’ve painted here is the Thaxted version of the Abbots Bromley Horn Dance. The Thaxted version is haunting, mystical. You feel like you’ve stumbled upon some primitive rite in the midst of the megalopolis. Like an ancient god will spring from the bay mud and perhaps accept a sacrifice as the dancers make their moves. It’s deliciously chilling and meaningful. But the Thaxted version an after-market dance. The original, still performed in Abbots Bromley after something like 800 years, is lively, fun, and a little goofy. Danced in daylight. Lot’s of bouncy tunes. To this Yank, Monty Python springs to mind. In the best possible sense, of course. This is a study for a larger painting I have in mind. As always, I imagine I’ll paint it many times before I get it to the place I want it to be. If you’re up before dawn on May 1, find a Morris team near you and go help them dance up the sun. 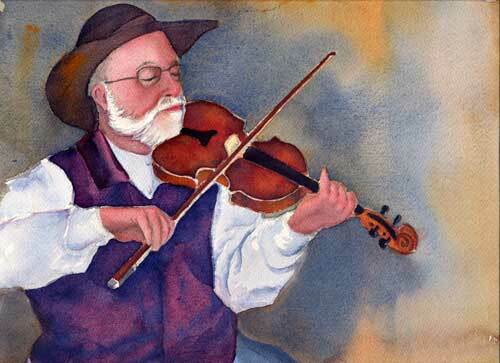 This is a painting of my husband in his costume for his old time band Harmon’s Peak. He was practicing before a gig and I snapped a few shots of him. 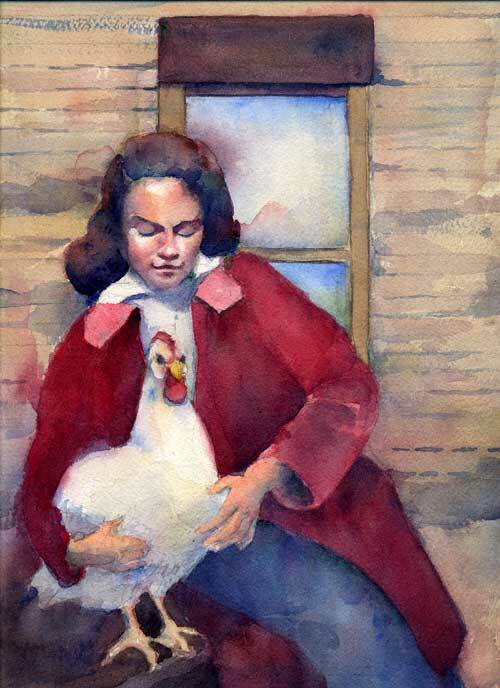 For the past 3 years I’ve studied watercolor with Steve Curl at the Pacific Art League in Palo Alto, California. 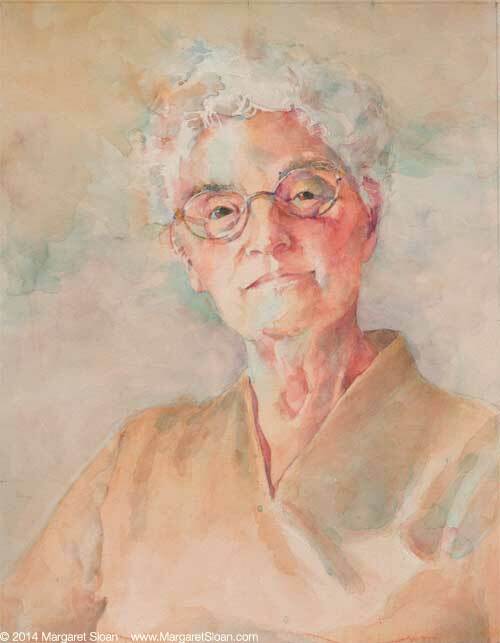 I’ve learned a great deal from him, particularly how to plan a watercolor, and then not be afraid of the paint. We work primarily from photos, which some artists think is cheating, but I always make my own drawing rather than projecting or tracing. And Steve always cautions us to not slavishly copy the photo, but to make a painting out of it. That may mean altering the photo a bit, leaving out the background, adding a tree, or rearranging the elements in the picture. In this painting I had to make up the light source, as I had used a flash for the photo and it washed out the nice home lighting that made me take the photo.